Scientists at Aberdeen University have been using drone technology to help save one of our planet's most endangered animals. Researchers have gathered in thousands of images from the skies above the Borneo rainforest, but now they need your help. "Drones are really useful because orangutans usually build their nests in the canopies of trees," says researcher Sol Milne. "Orangutans can weigh up to the size of a human, they can weigh about 80kg, so they build really substantial nests and there's a lot of engineering that goes into making them. "And it's great, because when the nest decays, it turns brown and we can see it from aerial images." Mr Milne is leading the project, under the direction of Dr David Burslem and Dr Julien Martin from the University's School of Biological Sciences. The drone use has been part of a conservation project funded by the United Nations to map the jungle canopy in the state of Sabah in Borneo, where government and industry have signed a landmark deal to help protect the forest. This kind of research used to be done on foot, trekking kilometres through thick jungle. 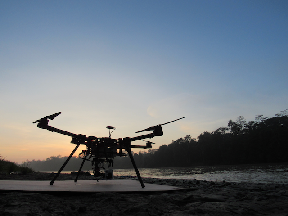 Drones have sped up that process and helped to reveal vital insights into orangutan behaviour. Mr Milne's findings already show that orangutan are choosing to nest close to strangler fig trees, a main source of food even more so now given the deforestation taking place around them. Around 70 drone surveys have been completed so far bringing in 20,000 aerial images. However, Mr Milne and the research team need help from keen 'citizen scientists'. Mr Milne has set up a web page here on Zooniverse where you can sign up to volunteer to scan some of the images and look for orangutan nests in the forest canopy to help the research team gather in more data. The more information they have, the more they can help guide conservation efforts on the ground. "We are asking citizen scientists to help out as our 'eyes in the sky' as part of this effort - by registering online and joining our survey, you can help us make a vital contribution to protecting critically endangered orangutans," adds Mr Milne. "Every click counts, so the more volunteers we can involve the better." Orangutan are closely related to humans, having 97% of DNA in common, but it's because of our race that this gentle animal is under threat. 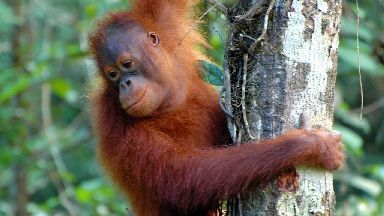 According to the WWF, orangutans are "gardeners" of the forest, playing a vital role in seed dispersal in their habitats. Orangutans' extremely low reproductive rate makes their populations highly vulnerable. Females give birth to one infant at a time about every three to five years, so these species can take a long time to recover from population declines. With human pressure only increasing, orangutans face an increasing risk of extinction. In order to combat this, ecologists have also joined forces with an unusual partner in a ground-breaking scientific collaboration. Astrophysicists have harnessed technology usually used to study the brightness of stars. By combining drones with thermal-imaging cameras, researchers are now able to spot and classify animals like orangutans by their temperature. "We tested the technology on orangutans in the dense tropical rainforest of Sabah in Malaysia," says Dr Claire Burke. "In thermal images, animals shine in a similar way to stars and galaxies, so we used techniques from astronomy to detect and distinguish them. 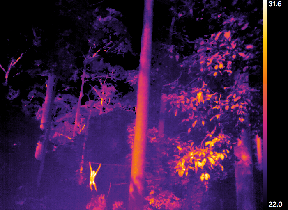 "We were not sure at all whether this would work, but with the thermal-infrared camera we could see the orangutans quite clearly because of their body heat, even during fog or at night." Astro-ecologists are now developing a machine learning algorithm to tell animal species apart, based on their unique thermal fingerprint. The hope is that in the near future, they will be able to track large numbers of species in real time, all around the globe. You could even pick up the heat trace of poachers. "In the future, we hope to be able to track, distinguish and monitor large numbers of different species of animals in real time, all around the globe, so that this technology can be used to make a real impact on conservation and stop poaching before it happens," says Dr Burke. Organisations like the WWF is made up of keen supporters of what the technology might mean for endangered animals. "I think all of us want to be involved in these things," says WWF Director of Science Dr Mark Wright. "When we see the images of deforestation and we see orangutans in peril and indeed any other species around the world we want to know what we can do to help. "I think these citizen scientist projects open the door to that engagement. 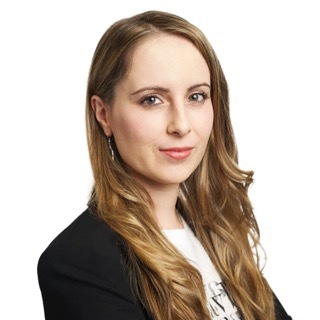 It allows people to engage in a very real way to what is happening and they feel that they are part of the solution as well." For more information you visit the Orangutan Nest Watch project here online. Footage courtesy of the WWF, Matt Jarvis, Journecology, Hoo Pui Kiat and Sol Milne.